We Torontonians are pretty lucky where food is concerned. We have no shortage of diverse and delicious restos in our city and there are constant new fun and exciting offerings. I love when restaurants have special events and menus as it makes for a fun dining experience and allows for customers to try a number of dishes. 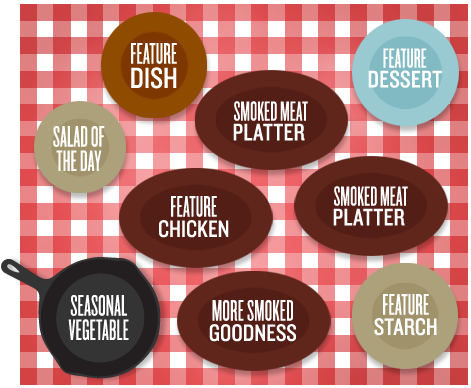 Confession- another reason I am very fond of set menus and prix fixe offerings is because I am pretty much the most indecisive person on the planet. Give me a lengthy menu, and I’ll give you an anxiety ridden Ash who changes her mind 237 times before the server takes her order. If you have ever dined with me, you know I am not exaggerating here. I have been hearing great things about Barque Smokehouse for a while. It is a traditional bbq joint where smoked chicken, brisket and ribs are the stars of the show. On Sunday’s they offer a family style set menu when you can try all of their famous bbq meats as well as some special accompaniments that vary from week to week. 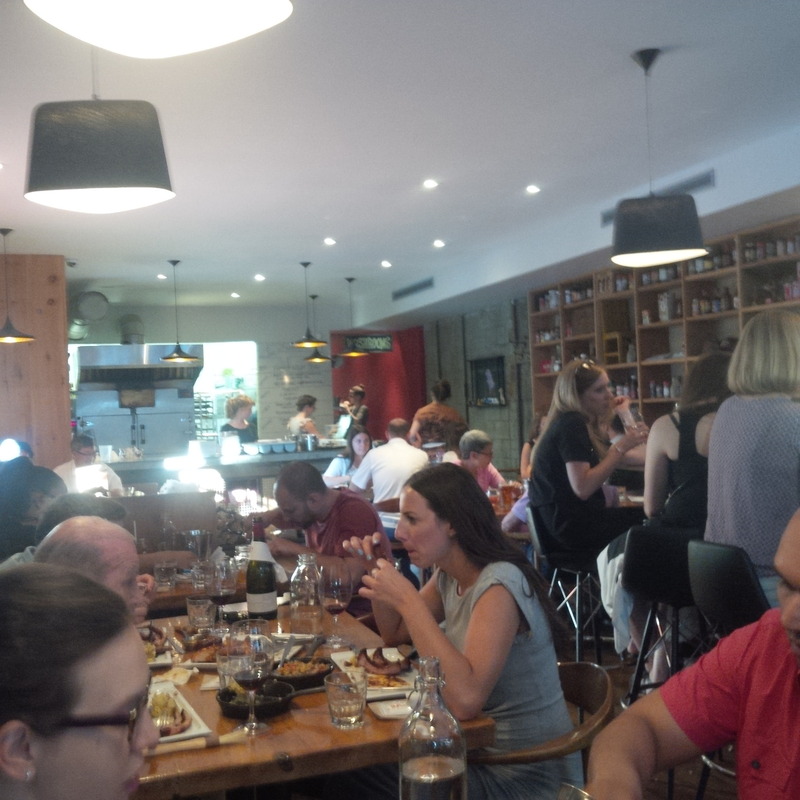 I headed (hungrily) down to Roncesvalles on a Sunday to check it out. Toronto’s Roncesvalles neighborhood is an older community in Toronto that has in recent years because home to some trendy shops and restaurants. 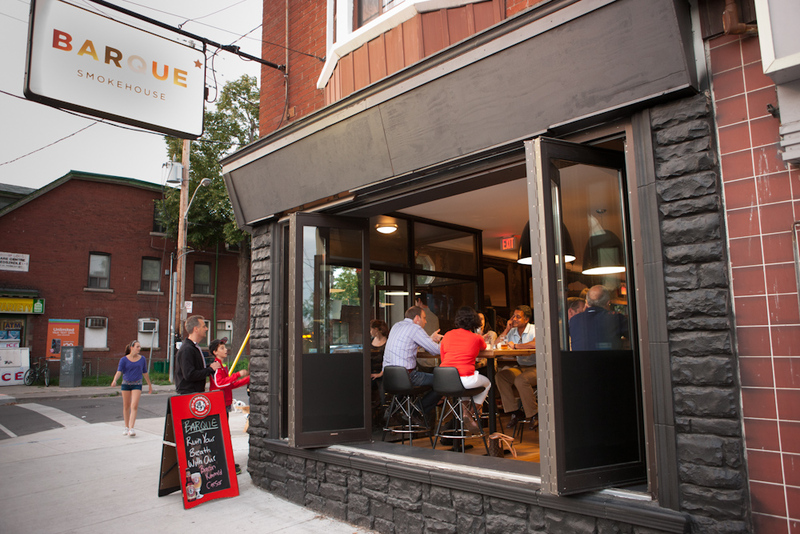 Barque is a small homey restaurant in the heart of what is known as the Roncesvalles Village. Barque is quite small, rustic and cozy. Reservations are very highly recommended at peak times, and well in advance for Sunday family nights as spaces fill quickly. Staff at Barque were friendly and welcoming. We arrived earlier than our reservation and they kindly seated us early which was much appreciated on a busy Sunday. Our server was great. She was very helpful with her explanation of the menu items and drink suggestions and let us know about the popular brunch at Barque. So here is how my family night feast went down. 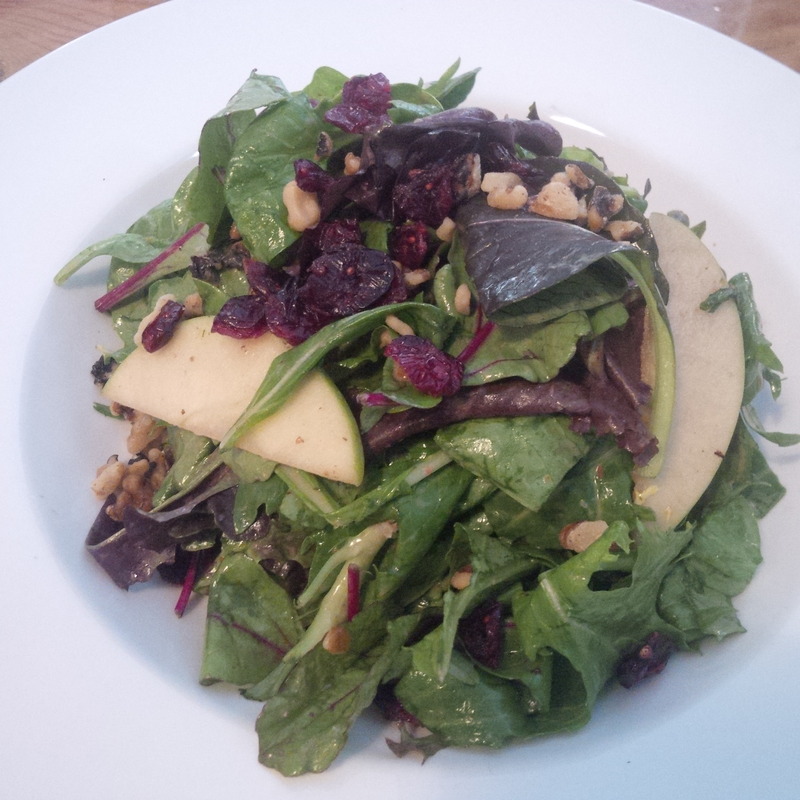 The meal began with a yummy salad of greens, cranberries, apple and walnuts in a citrus vinaigrette. The salad was fresh and simple with really complimentary summer ingredients. 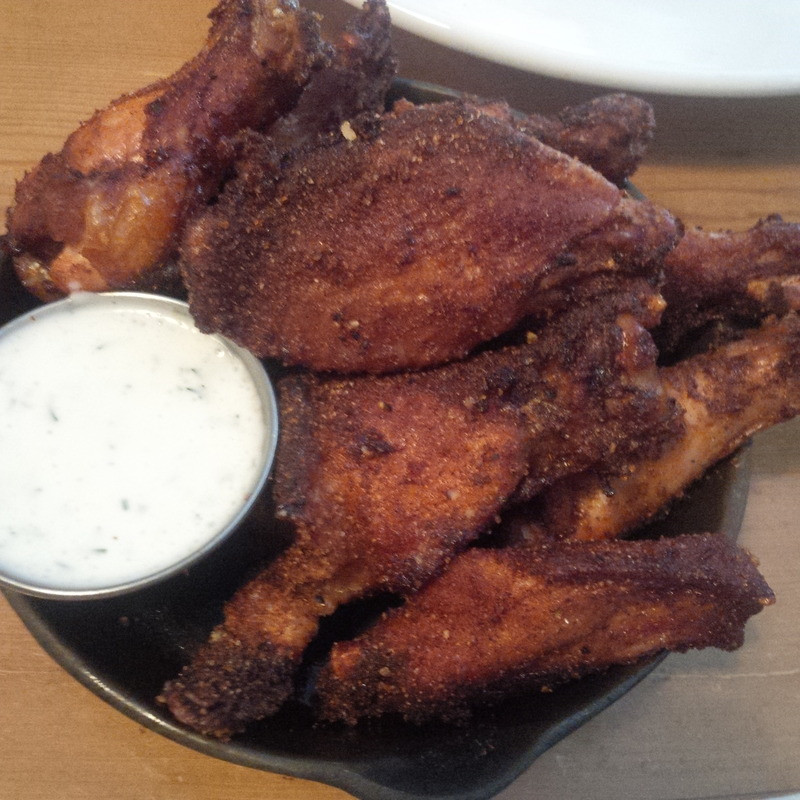 Shortly after the tasty salad, we received some smoked dry rub wings with a homemade dill sauce. These were the most delicious chicken wings I have ever had. The dry rub was extremely flavorful and the smoked chicken was tasty and moist. A bbq and mustard sauce were provided to accompany all of the meat and while these were delicious, I preferred the mango habanero hot sauce. These wings with that hot sauce were perfection. Now for the main event. A trio of Barque’s famous smoked meats were presented. 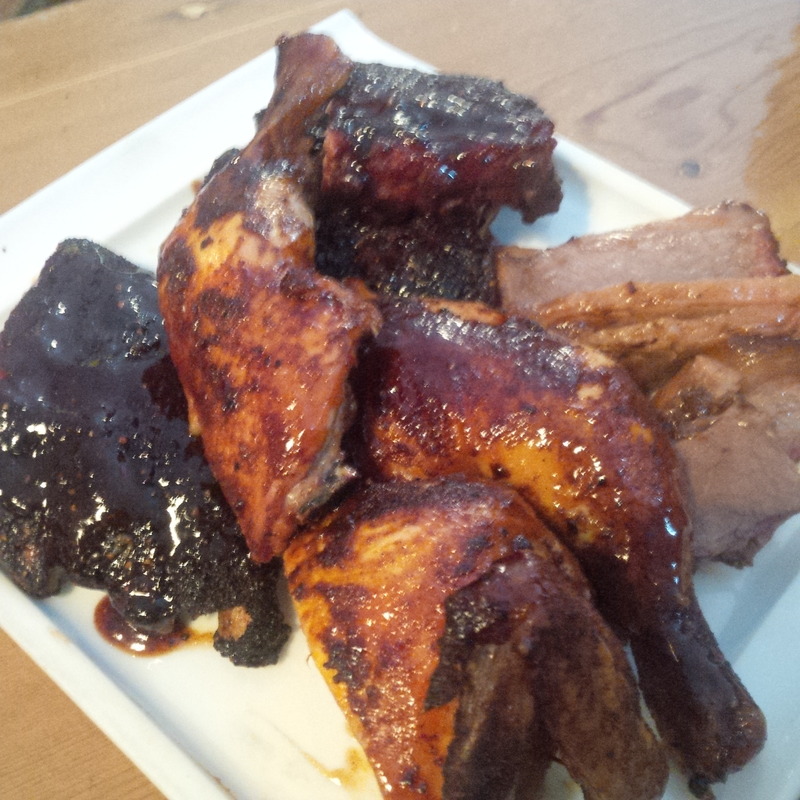 Smoked chicken, baby back bbq ribs and beef brisket. These were all smoked and seasoned to perfection. My favorite as the chicken. But, it is worth mentioning that everyone at my table had a different favorite as they were all three delicious. 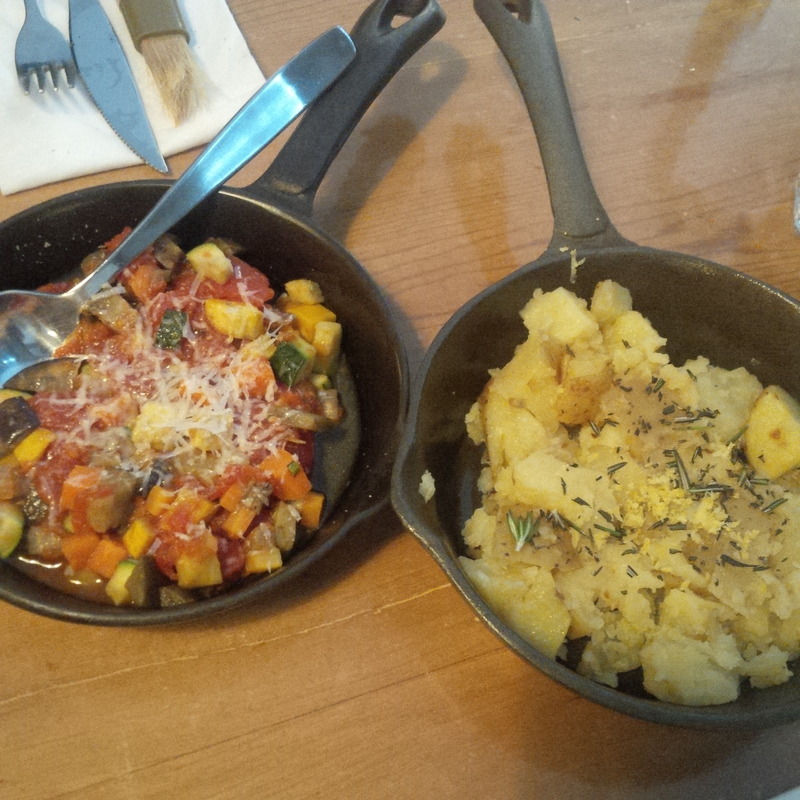 The accompaniments were roasted potatoes with herbs and lemon zest and a vegetable ratatouille. The potatoes were so deliciously lemony. We wondered if they had been soaked in lemon juice and this is definitely something I am going to attempt to recreate at home. I also really loved the ratatouille which was made of an array of tasty sautéed vegetables. As you can imagine, we were pretty full (and happy) at this point. But, we had left room for a little dessert. Good thing because it was a good one. 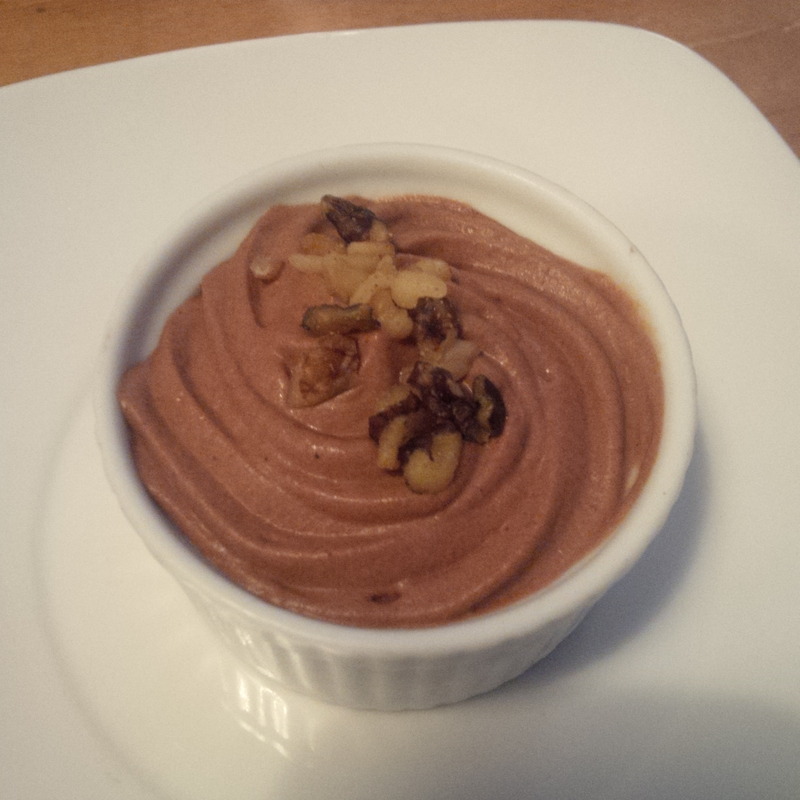 Chocolate banana mousse was the perfect dessert to cap off a fantastic bbq feast. The mousse was just the right size and delectable without being excessively sweet. Delish. The Family night menu at Barque is $25 per person. I think this is a fantastic deal for the experience, quality and amount of food that you get on Sundays. A small detail, but I also appreciated the fact that sparkling water is a complimentary option at the restaurant. The regular Barque menu is full of great options at reasonable prices, but I feel Sunday family night is the best bet for value and an opportunity to try it all! 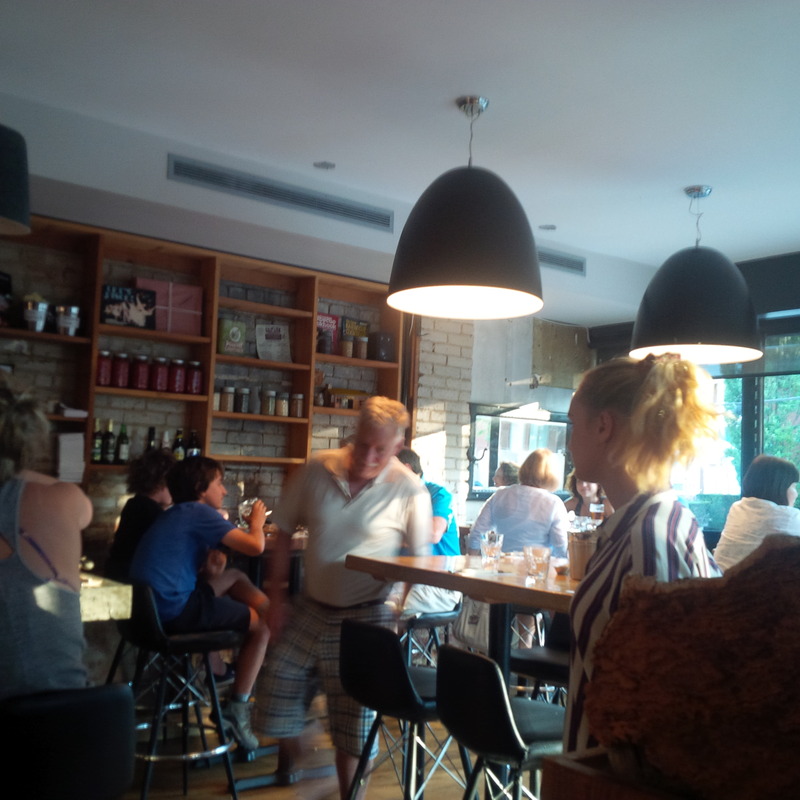 Barque is a great little restaurant in a charming area of Toronto that I love. I welcome the opportunity to head down there and tuck into some delicious bbq any time. I would highly recommend the Sunday family dinner option as I loved everything presented to us. I also really like the idea of the menu changing from week to week, and the surprise of finding out what will be served on the day of your visit. For good times and mouthwatering bbq, Barque gets two thumbs way up from me. If you have been to Barque, or decide to give it a try I would love to hear about it! 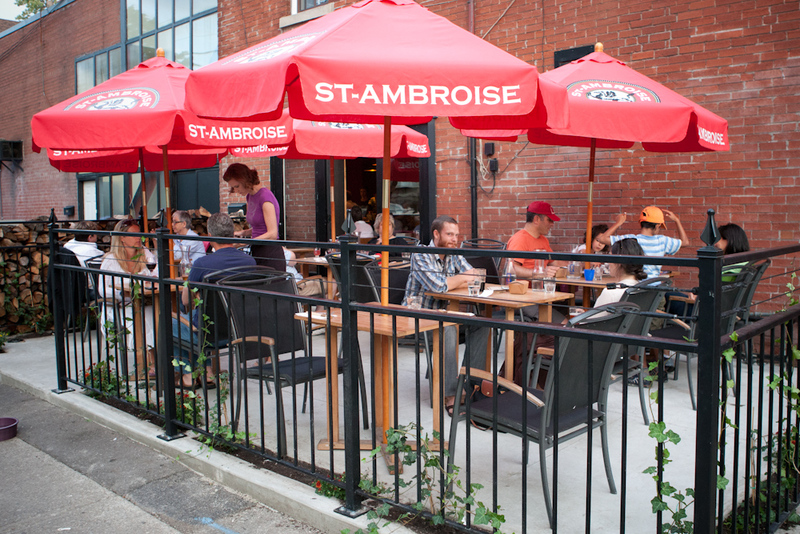 Barque is located at 299 Roncesvalles Avenue (416) 532-7700. As a dedicated meatatarian, I must try this place!! !